Two decades into South Africa's democracy the ‘rainbow nation’ seems to be drifting and in search of a new policy direction to help it overcome its daunting challenges. This book is IRR's argument on what has gone wrong and what needs to be done to fix South Africa. This book explains how South Africa has moved from the Mandela era to the Zuma one. It does so by reference to ten crucial policy areas which it terms the ‘ten pillars of democracy’. The ‘ten pillars’ range from individual rights and racial goodwill to growth-focused policies, free enterprise, and good citizenship. Scores assigned to each pillar provide a shorthand way of summing up the country’s performance from May 1994 to April 2009 and mark the start of a new annual monitor of democracy, the ‘Rainbow’ index. The book you’re holding contains a vanishingly rare and valuable commodity. You could call it information, I suppose, but that’s misleading… The commodity we lack is clarity, and that’s what Anthea Jeffery provides in Chasing the Rainbow. But all is not lost. As Jeffery notes, South Africa is a democratic country with a vigorous free Press. As our problems mount, debate has intensified, and the process might yet reveal solutions. Jeffery’s great achievement in this book is a precise and clinical dissection of those problems. As such, it could be a critical part of our salvation. 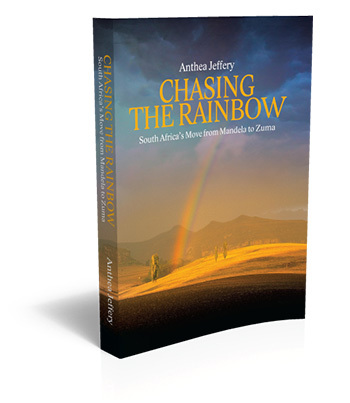 Anthea Jeffery holds law degrees from the University of the Witwatersrand and from Cambridge, and a doctorate in human rights law from the University of London. Her previous books include Business and Affirmative Action, The Truth about the Truth Commission and People’s War: New Light on the Struggle for South Africa.